-Well, finally after a long time, i decided to make a contest. 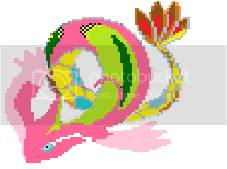 -The theme of this contest is Recoloring Milotic, again. -You need to recolor Milotic anyway you like. Just RECOLORING. Deadline? And we can change entries right? You have encountered a wild Togetic! You have encountered a wild Fearow! The sprite was a little cut off so I corrected that. The Voting thread will be up soon.